Many car owners don't even realize that such a part exists in their vehicles, much less if it ever needs to be changed. But, no matter if they know it or not, a cabin air filter is an essential part of your car's ventilation system that removes pollutants from the air before they get inside the passenger compartment. They were originally designed to remove solid contaminants like dust and soot from circulating inside your vehicle. They can also absorb gases and odors. Cabin air filters may also be known as passenger compartments filters, interior ventilation filters, pollen filters or dust filters. It is an undisputed fact that roadways (especially major highways, during rush hours) are some of the major sources of air pollution. Therefore, as you are driving, you are forced to breathe the air tainted with exhaust fumes, dust and soot particles, many of which may pose a serious hazard to your health. The cabin air filter is there to prevent all those pollutants from entering the passenger compartment. 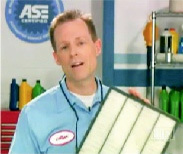 Why and how often should you change the air cabin filter? Eventually, a cabin air filter starts to loose its effectiveness, as it gets dirty with use. This may result in unpleasant odor, and decreased heating and air conditioning performance cause by restricted airflow through the filter. It is recommended to replace the cabin air filter at least once a year or every 12,000 to 15,000 miles - more often if your vehicle is operated primarily in areas of heavy pollution or dusty conditions. No, this is not true. In fact, our federal government has passed a law called the " Magnuson-Moss Warranty Act" that protects your rights to choose any competent shop to perform your warranty related maintenance work. 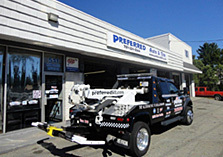 In addition, this law provides you with the option of using any name-brand parts to service your vehicle. The manufacturer cannot force you to use only their parts ( spark plugs, fluids, filters, brake pads, wiper blades, etc.) the only exception to this rule is when the factory parts are defective and fail, while still under warranty or, have been recalled and are to be replaced FREE. To maintain your new car warranty, all you have to do is have your vehicle regularly serviced at intervals specified in the owner's manual and/or warranty booklet and keep detailed records of those services ( which we'll do for you). Just ask yourself this: " Does it make sense to build a long-term relationship with a neighborhood garage who's only interested in maximizing the life-span of your vehicle investment, or drop your car off to a place that would like nothing more than sell you a new one? " Which option is in your best interest?